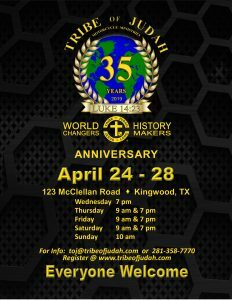 You are invited to celebrate God’s goodness and faithfulness over the last 35 years of reaching and helping people. Join us for eight power-packed services sure to bring breakthroughs, strength, and encouragement to your life in an atmosphere prepared for signs, wonders, and miracles! Not only will this be a life-changing event, but there will be plenty of “hanging out” time with family under the black & gold tent! Register below for this awesome event!